For a brief stint in Chicago, one of my go-to orders at the new Asian restaurant Sunda was their crispy brussel sprouts appetizer. They were insane! 🤪 But they were also doused in deliciously flavored oil and a sugary vinaigrette so it’s not surprising they were like crack! To say I love my veggies is a bit of an understatement – I happily munch on raw kale, need I say more?! Anyway, I get that most people don’t share the same set of taste buds and that brussel sprouts regularly fall into the category of least loved vegetables. But they’re SO good for you! Packed full of vitamins, fiber and a good source of plant-based protein. So, I hope this recipe does the trick in converting some of you out there into lovers of these bite-sized cabbages. These roasted, buffalo-style Brussel sprouts have a hint of cheesiness from the nutritional yeast. They make for an awesome accompaniment at any game-day parties you’re heading too. I don't know why Brussel sprouts aren't more popular. Whether they're cooked in bacon fat or just roasted in a little oil, I think these baby cabbages are the bomb.com! If you don't agree, then your loss and all the more sprouts for me 😋 But seriously, give this buffalo style recipe a whirl! Preheat oven to 375 degrees F and line two baking pans with parchment paper or silpat baking sheets. In a small bowl, combine the melted coconut oil, hot sauce, nutritional yeast, garlic powder, paprika, cayenne and salt & pepper. 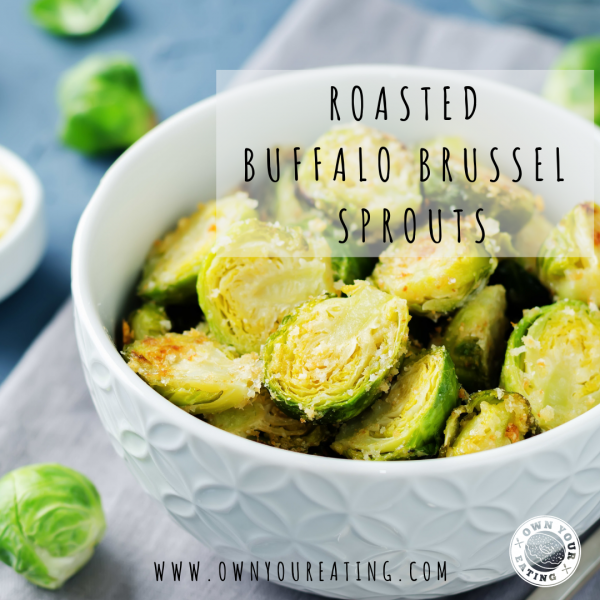 Place the brussel sprouts in a larger bowl and then spread the buffalo mix evenly over them. Toss the brussel sprouts to throughly combine. Pour the brussel sprouts out on to the baking trays and roast for approximately 30 minutes, turning or tossing at the halfway point. The serving size is about 50g or 1/2 a cup.